The head of the Revolutionary Guards slams Foreign Minister Zarif, who said a U.S. attack could paralyze Iran. The head of Iran's powerful Revolutionary Guards had harsh words on Tuesday for the country's foreign minister, over comments he had made about the military's ability to withstand a potential American attack. The criticism against Foreign Minister Mohammad Javad Zarif appeared to be part of the broader political pushback by Iranian hard-liners against President Hassan Rouhani's new administration, reported The Associated Press (AP). The latest spat revolves around comments Zarif made last week to students at a Tehran university, where he said a U.S. military attack could paralyze Iran's defensive system. 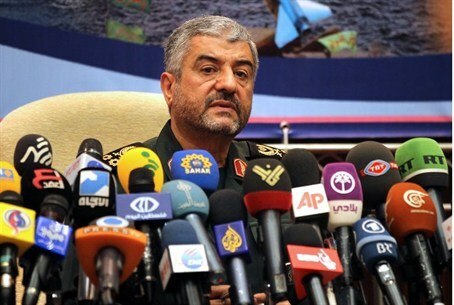 On Tuesday, Gen. Mohammad Ali Jafari dismissed Zarif's remarks, saying the foreign minister "has no expertise in the field of defense," and "his comments comparing the military power of Iran and the United States were incorrect." Speaking at another Tehran university, Jafari said the U.S. could only destroy up to 20 percent of Iran's missile capability if it bombs the country heavily, according to a report by the semi-official Fars news agency. Zarif, who played a major role in the interim nuclear deal with world powers last month, kept steady despite pressure from hard-liners, who have sharply criticized the agreement, according to AP. He has tried to assure them that his negotiating team will strongly defend Iran's interest if the U.S. and its allies change course. The public in Iran seems to have warmer feelings for the Foreign Minister: Zarif and the other members of Iran’s nuclear negotiating team received a hero's welcome when they returned home the day after the deal was signed. Zarif has also been known to “talk tough” when it comes to defending what Iran sees as its right to enrich uranium. On Monday he warned that new U.S. sanctions would kill the nuclear deal negotiated last month. "The entire deal is dead," Zarif told TIME Magazine, adding, "We do not like to negotiate under duress. And if Congress adopts sanctions, it shows lack of seriousness and lack of a desire to achieve a resolution on the part of the United States.